Personal injuries from a car accident can encompass many situations and types of injuries. Whenever someone has been injured due to a negligent driver, recklessness, or inattentiveness of another, there may be cause for a personal injury case. If successful, an auto accident injury case can result in compensation that can help the victims deal with medical bills, lost wages, or other expenses incurred as a result of an accident. If you have been the victim of a personal injury accident and need compensation to recover, accident attorney Stephen M. Forlizzi has helped clients in Peabody MA, Salem MA and Beverly Massachusetts. And he may be able to help you. For over 30 years, Stephen M. Forlizzi has been helping victims from car accidents in Massachusetts and works tirelessly to get what they need and deserve. The laws are very clear about liability and how compensation is awarded. Our firm gives every case personal attention. 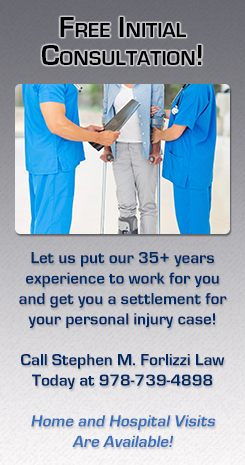 We will assess what kind of compensation you may need to recover. We will give you honest advice and guidance so you can decide the best course of action for your situation. Our firm will fight to protect your rights and use our negotiating skills to get you the settlement you need. We will investigate the facts, talk to witnesses, and keep you informed of the status of your case every step of the way. We know a personal injury accident can leave you unable to work, swamped with medical bills, and unable to do the things you once loved. We understand how a personal injury can have a major impact on your life, both temporary and permanent. The Law Firm of Stephen M. Forlizzi will give you a free consultation so we can determine how we can help. We can come to your home or hospital so you can focus on your recovery, while we focus on your needs now and in the future. Call Stephen M. Forlizzi today to find out what we may be able to do for you.